CAMRA LocAle is the accreditation scheme to promote pubs that sell locally-brewed real ale, reducing the number of ‘beer miles' and supporting local breweries. The scheme builds on a growing consumer demand for quality local produce and an increased awareness of ‘green' issues. The CAMRA LocAle scheme was created in 2007 by CAMRA's Nottingham branch which wanted to help support the tradition of brewing within Nottinghamshire, following the demise of local brewer Hardys and Handsons. 5 LocAles on handpunp at the Railway, Streatham where all cask ales are London brewed. Several pubs in our area now have LocAle accreditation. This entails a pub permanently stocking at least one qualifying LocAle. 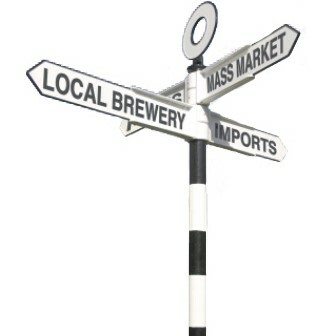 For our puposes a LocAle is defined as a real ale produced within thirty miles of the pub. SW2 Crown & Sceptre, Streatham Hill - Wandle & Junction always on. SW2 Elm Park Tavern, Brixton Hill - At least one By the Horns beer is always on. SW4 Prince of Wales, Clapham Old Town - A Sambrook's beer is always on. SW8 Priory Arms, South Lambeth - A Sambrook's or Twickenham ale always available. SW11 Draft House Northcote, Battersea / Clapham Junction - has at least one Sambrook's beer, usually Wandle. SW11 Draft House Westbridge, Battersea - The first pub to have Sambrook's Wandle which is brewed nearby. SW11 Eagle Ale House, Battersea - Our current SWL Pub of the Year has at least one Westerham Ale always available. SW11 Falcon, Battersea - At least one Sambrook's Ale always available. SW11 Lighthouse, Battersea - Sambrook's Wandle is now on permanently and is served with or without sparkler according to customer request. SW11 Northcote, Battersea - Sambrook's Wandle & Junction plus a Twickenham beer. SW12 Nightingale, Balham - At least one Sambrook's beer is now on permanently. 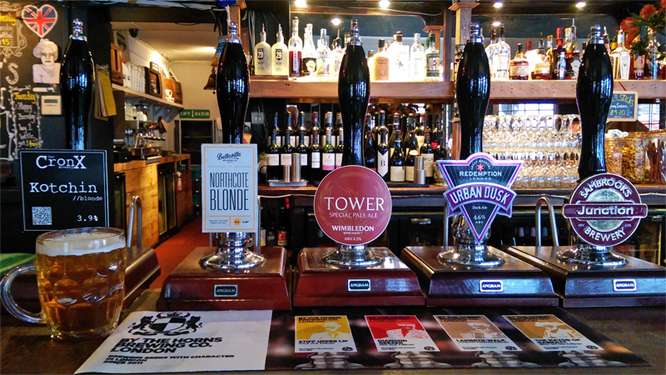 SW15 Rocket, Putney - Always at least one locally brewed ale available. SW16 Earl Ferrers, Streatham - Sambrook's Wandle is always on alongside at least one other qualifying micro brewery ale. SW16 Railway, Streatham Common - Only London brewed ales on the 5 handpumps, usually including a Sambrook's choice. SW17 Wheatsheaf, Tooting Bec - 3 or 4 London brewed beers always available. SW18 Old Sergeant, Wandsworth - A Sambrook's beer is usually available. SW18 Pig & Whistle, Wandsworth - A Sambrook's and/or a Twickenham beer is usually available. SW18 Roundhouse, Wandsworth Common North Side - This was the 2nd pub to have Sambrook's on permanently. SW19 Hand in Hand, Wimbledon Common - Sambrook's; Twickenham or other. SW19 Trafalgar, High Path, Merton - Surrey Hills Shere Drop plus up to three others, often with one from By The Horns. SW19 Wibbas Down Inn, Wimbledon - At least one LocAle available. SW20 Edward Rayne, Rayne's Park - At least one LocAle available, and possibly from Clarence & Fredericks. Please get in touch with our LocAle coordinater, Peter Sutcliffe [email: peter.sutcliffe@camraswl.org.uk], if you know of any other pubs in our area which should be afforded LocAle accreditation. All recommendations will be checked out and any qualifying pubs will be considered for inclusion on this list.